If the song of the summer is “Blurred Lines” (although I’m partial to “Get Lucky” too), then the cocktail of the summer is the Aperol Spritz. I started drinking these a few months ago when, after a long day of wine tasting, I couldn’t have a drop more of wine. Someone told me to get an Aperol Spritz, and the bubbles and slight bitterness of the Aperol was the perfect balance to all the wine I’d been having. Campari is ruby colored, Aperol’s orange (the one on the right above). Aperol has a higher sugar content than Campari, but less alcohol. Aperol has only 11% alcohol while Campari has more than double that at 25%. 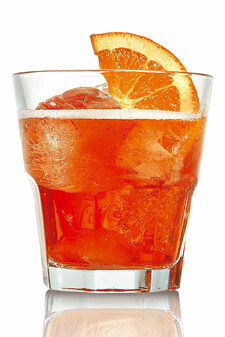 The ingredients used in Campari are a secret, but supposedly it contains Seville orange and herbs. Aperol’s made from many ingredients: licorice, fennel, aniseed, bitter clover, wormwood, valerian, gentian, bitter orange, cinchiona and rhubarb. That’s a lot of ingredients. Anyway, every Friday this month I’m doing a bubbly cocktail that will help you beat the heat. So here’s today’s refreshing recipe! Happy weekend! 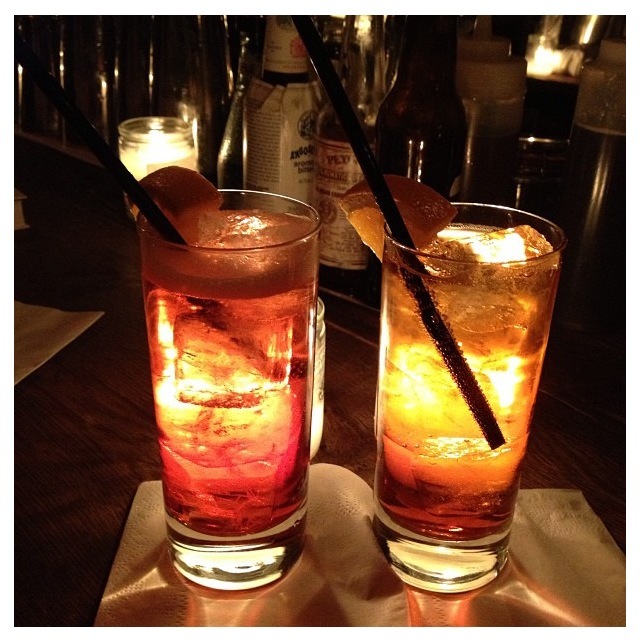 Let me know what your bitters of choice is – Campari or Aperol. People get very opinionated about it. Tags: aperol, campari, cocktail, cocktails, food & drink, Prosecco, recipe. Bookmark the permalink. I definitely prefer Aperol spritz and that’s interesting how the spritz is getting famous around the world, once it was something drank only by old people. It’s one of the most typical drink in the North-East of Italy, the area where we (spritz and I) come from. Every good cocktail probably has a good story 🙂 Where are you from in Italy? I agree, btw I’m from Treviso the area of Prosecco, half an hour drive from Venice. Why unhealthy, sugar and alcohol? Aperol is unhealthy because the ingredient list also includes chitin. As far as I know consuming too much chitin is poisonous. Is Aperol considered a wine or a spirit? The Spritzer sounds like something I would enjoy! Spirit! Not made from grapes… It’s delicious. I loooove aperol spritz. It’s the only thing I drank in Venice! But I hate campari in anything – I find Aperol much less bitter. For me it must be served in a wine glass, with a big fat green olive at the bottom! Yum. This is a very refreshing summer drink. I first had one in Las Vegas at one of Mario Batali’s restaurants. Campari is too bitter for me; I definitely prefer Aperol. I often sub Aperol or Cynar in for Campari in cocktails. The hubs has been humming “Get Lucky” all summer which, I must admit, is an improvement over the shower renditions of “Dead or Alive”. Loving the suggestion of the aperol spritz. My typical poolside mojitos have been a little boring lately. more coming every Friday this month – cheers to drinking poolside! It’s one of the most popular cocktails in Europe, especially now in the summer. We usually order it as aperitif 🙂 Cheers!